Your company may already be migrating to the cloud without your even knowing it. A recent survey found that companies are increasingly moving away from being owners of IT platforms. Companies are spending 19 percent of their software budgets on applications delivered as services, the survey said. That is, they are eschewing the traditional model of licensing software for use on a company server in favor of subscribing to software that is housed on a vendor's server. What's more, 23 percent of executives think cloud computing is the best model for running IT systems outside a company's four walls. Cloud computing is a rebranded form of "utility" computing, a less-clever but more-apt description for the underlying model: computing becomes a utility that you simply plug in to. You would no more think of owning your own IT infrastructure than you would of owning your own power plant. Many of the products and services needed to achieve this vision exist today, but, as Frank Gillett, a principal analyst at Forrester Research, has noted, "The rising buzz about clouds is creating a cacophony of confusion." Cloud computing is not about handing off management of a data center. Instead, it's about buying standardized IT capabilities — memory, storage, processing power, software — on-demand, over the Internet, billed according to usage. Companies could ditch some or all of their servers and other fixed assets and tap a virtualized pool of computing resources via an interface as simple as a Web browser. 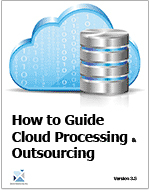 It is never too late to implement these Cloud Outsourcing best practices. It can be done on initiation of services, day-today operation, and or contract renewal. The HandiGuide is delivered electronically in WORD and/or PDF format. The word version of the template was recently updated to utilize CSS a style sheet. If your enterprise is going through periods of rapid or dramatic change, including changes in the way you do business, how will outsourcing impact this? Your enterprise's IT function is efficient and has a low cost of operation, what value will the outsourcer provide? The primary motivator for outsourcing is the drive to reduce costs, why could you not do the same internally? Internal costs of the IT function are not fully understood, how will you know that you are getting the most cost effective solution from your outsourcer? Performance metrics are not well defined for the IT function, how do you know that the service provided by your outsourcer will be as good if not better than what the enterprise is getting today? The enterprise operations are entwined with IT functions such that if the IT function is outsourced a significant amount of core enterprise functionality and operational knowledge will have to be transferred to the outsourcer, will the outsourcer have a large "learning curve"
The enterprise's strategic plan has not been defined with all of the outsourcing implications defined, is it possible that outsourcing is not in the best interest of the enterprise's operation?